The Council is a Cohort- based leadership program to promote, encourage and develop leadership that reflects the diversity of the CACFP community-at-large. The Leadership Council assists its members to recognize their passion- to realize their purpose - to become leaders. The National CACFP Leadership Council (the Council) is a cohort leadership program to promote, encourage and develop leadership that reflects the diversity of the CACFP community-at-large. The Council program enables members to recognize their passion- to realize their purpose - to become leaders. The council is only available to National CACFP Forum members (membership includes staff). Council leaders will find an environment in which they are motivated to develop a sense of CACFP community trusteeship, seek out and assume leadership roles in the CACFP community. As Council leaders take part in National CACFP Forum Board imitative, Council members will learn leadership skills to protect the Child and Adult Care Food Program (CACFP), to perfect the policy in CACFP, and promote leadership in CACFP. Council leaders will become active leaders in the CACFP community and take the Forum mission into the community at large. Gain insight into the operation of a board of directors. This is an opportunity for Council leaders to participate on a board of directors and see how they operate prior to having the responsibility of a vote. The council members will become familiar with board development, governance, and policy. 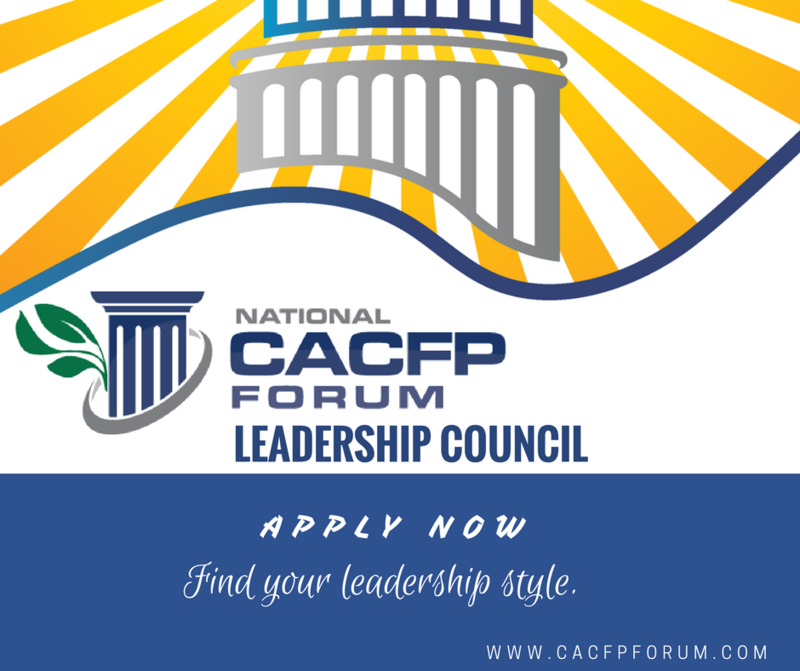 Council leaders will work with National CACFP Forum board members and other national leaders to develop and craft their overall leadership style and skillset. The leadership includes committee work, a mentor program, webinars, library, and seminars. The Council leaders will be invited to serve a 3 year term and have an opportunity to become a National CACFP Forum Board member if they choose. ​Create stronger individual leaders to shape and strengthen the CACFP community in their local agencies and nationwide. We aim to establish a culture of professional excellence and leadership within the CACFP community. Ensure that thoughtful and intentional leadership development becomes the norm for the CACFP Community. The Council leaders will discover who they are as a leader to maximize their impact in the community.